Leeds University Hits the Spot Again. 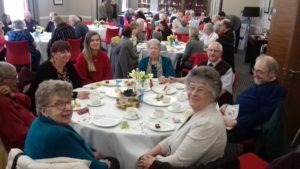 Caring Together were invited to, and attended, the annual University of Leeds Older People’s Tea Party last week. As per usual we were treated fantastically well by the students and fed, watered and entertained to a high standard. Many thanks to all of the staff and students for organising this. It is greatly appreciated.